A phytobezoar is a concreted mass of undigested plant materials trapped in the gastrointestinal system and mostly in the stomach. A diospyrobezoar is a type of phytobezoar and is a rare condition; it is due to unripe persimmon ingestion. In this case, report, we recount the experience of a 26-year-old man who presented signs and symptoms of acute appendicitis, which was later diagnosed as a gastric diospyrobezoar. An appendectomy was done, but the symptoms were not resolved. This gastric phytobezoar was successfully removed through gastrotomy after a failed attempt in endoscopic fragmentation and removal. This report provides an overview of bezoars in patients with acute abdominal pain. A careful history with an emphasis on recent diet can be of great help in the diagnosis of similar cases. Bezoars present themselves as a conglomerate of digested or undigested materials, such as vegetable fibers, hair, and other substances, that fail to exit the stomach and become trapped in the gastrointestinal tract. The most common site of entrapment is the stomach. The formation of a bezoar is infrequent with a varied prevalence according to different studies, but it has generally been reported in less than 1% of patients (1). Bezoars can be classified into four main types (Phytobezoars, Trichobezoares, Pharmacobezoars, and Lactobezoars) depending on the consumption and trapping of materials, such as vegetable fibers, hair, medications, and inspissated milk, respectively (2-4). Predisposed risk factors include previous history of gastrointestinal surgery or vagotomy, peptic ulcer disease, chronic gastritis, Crohn’s disease, carcinoma of the gastrointestinal tract, dehydration, hypothyroidism, and diabetes. Our patient had no previous history of gastrointestinal surgery or vagotomy, diabetes, or psychiatric consultation (1, 5). A diospyrobezoar is a type of phytobezoar. It is a rare condition resulting from unripe persimmon ingestion. Small types pass through the digestive tract on their own or with use of medications, but those larger in size may require surgery (6). Here we describe a case of a diospyrobezoar that was removed successfully from a young man. After gastrotomy, the patient's general condition improved, and his complaints were resolved. During the follow up one year later, the patient did not report any discomfort. A 26-year-old Iranian man was presented to the emergency department with complaints of acute abdominal pain as the onset symptom. The patient then described migration of the pain to the right lower quadrant (RLQ), nausea, vomiting, and anorexia. RLQ tenderness was found in the physical examination as well as positive rebound tenderness and elevated temperature (37.9°C). No mass was palpated. The patient’s hemodynamic parameters were stable (blood pressure: 135/85 mm Hg, heart rate: 85 beats/minute, O2 sat: 99.8%, and RR: 20). Laboratory exams showed leukocytosis (white blood cell count > 13200 mm3) with a left shift. Based on the Alvarado scoring system, a score of 10 was obtained. This score suggests high possibility of acute appendicitis, and a surgical procedure is recommended. The patient’s past medical history was negative for coronary artery disease (CAD), hypertension, diabetes, and high blood cholesterol. He did not take any medications and did not use alcohol, cigarettes, or any other illicit drugs. The patient had no previous history of gastrointestinal surgery, vagotomy, diabetes, hypothyroidism, or any problem in gastric acid production; furthermore, psychiatric consultation revealed no underlying psychological or emotional disturbances. He only reported a positive family history of gastritis. The fluid and electrolyte disturbances were corrected. The patient was then transferred to the operating room with a clinical diagnosis of acute appendicitis, and an appendectomy was performed. The pathology report showed a vermiform appendix with no significant pathological changes. After the appendectomy, the symptoms were not resolved and aggravated. The patient complained of feeling severe gastric pain, abdominal fullness, abdominal bloating, nausea, and vomiting. In a physical examination, no abdominal tenderness was found. Temperature had decreased to 37°C. In the second week after the appendectomy, an upper GI endoscopy was performed and a giant bezoar in the stomach was discovered. The endoscopy was unsuccessful in extracting the bezoar. 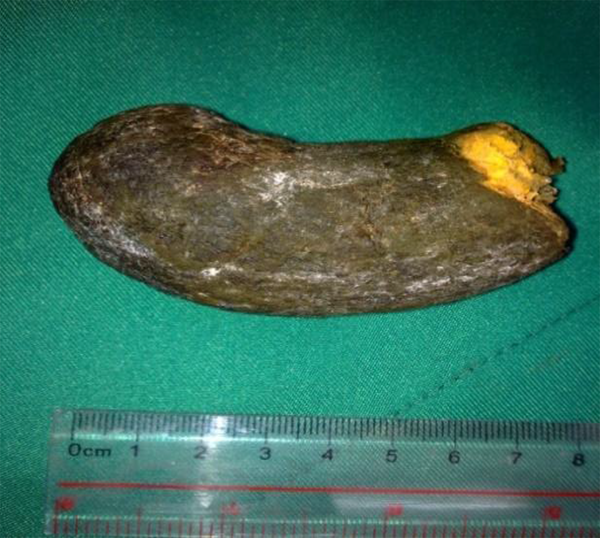 Gastrotomy was performed on the patient, and a giant green-orange bezoar with a size of 9 × 5 × 4.5 cm was removed from the gastric lumen (Figure 1). The patient had no previous history of gastrointestinal surgery or vagotomy, diabetes, hypothyroidism, or any problem in gastric acid production. Psychiatric consultation had shown no underlying psychological and emotional disturbances. After gastrotomy surgery, another evaluation for thyroid function, fasting blood sugar (FBS), and lipid profile was carried out. The patient’s recent diet just before the beginning of the symptoms has been 3 kg of persimmons on an empty stomach. The patient was discharged on the postoperative fourth day with full recovery. During the one-year follow up, the patient did not have any discomfort. A written confirmation was provided by the patient giving his informed consent for the case report to be published. A bezoar develops within the stomach or any site of gastrointestinal tract by compaction of repeatedly ingested, semi-digested, or undigested materials, such as food, hair, or other materials. The term bezoar derived from the Persian pad-zahr, which is traditionally believed to have the power of an antidote against poisons (2, 3). Most of the patients are asymptomatic or have non-specific symptoms that vary, including painepigastric, such as distention, postprandial fullness, nausea, and vomiting (7, 8). Kehr’s sign, which is referred pain felt in the tip of the shoulder due to blood or other irritants in the peritoneal cavity, can sometimes be seen. Renal calculi is reported as another symptom (9). Rapunzel syndrome can also be seen (10); this syndrome is rare and is due to trichophagia. It occurs when the tail of a hair is extended from stomach into the intestine, and it can lead to bleeding and obstruction (10). If small bowel obstruction (SBO) occurs, clinical manifestations, such as reduced bowel sounds, leukocytosis, rise of body temperature, and rebound tenderness, are observed (11). In many cases, bezoars are present with signs and symptoms of acute abdominal pain, such as the patient presented in this case report, which mimicked the relatively common illness of appendicitis. Bezoars may consist of a variety of materials. Their origins may include the remains of plants and vegetables, such as compact and semi-digested materials (Phytobezoars), consumed hair followed by psychiatric ailment (Trichobezoare), improper dissolution of medications (Pharmacobezoars), and receiving inspissated milk (Lactobezoar), which is mostly seen in premature infants (2-4). Diospyrobezoar is a type of phytobezoar followed by persimmon crude fiber ingestion and is a rare condition; gastric acid comes in contact with the fruit to form an adhesive material, creating a bezoar which consists of protein, cellulose, and hemicelluloses (12). The prevalence of bezoars has increased due to gastrointestinal tract surgical manipulation (8). The overall prevalence of bezoars is less than 0.5% of upper digestive tract endoscopy examinations, and in the small intestine it is 0.4% - 4.8% of all cases presenting intestinal obstruction (13). However, the prevalence of bezoars likely varies among ethnic groups and geographic locations, since the occurrence rate of a phytobezoar is mostly reflected in food cultures and habits. For example, diospyrobezoars have been reported in regions where the residents frequently consume fresh persimmon fruits and dried persimmons (Diospyros kaki) (14). Causes are delayed stomach emptying and dysmotility due to gastric surgery, improper gastric acid production, gastroparesis in diabetes patients, and hypothyroidism (15). Our patient had a history of overingestion of persimmons and had no evidence of any other predisposing factors described above. Bezoars are discovered as a mass lesion on most tests (e.g. x-ray, ultrasound, CT). Studies showed CT findings in SBO (16, 17), endoscopic evaluation, and abdominal ultrasonography are other useful methods to diagnose this condition (18). Bezoar treatment consists of medical treatment, surgery, and endoscopic procedures. Patients with minor symptoms profit from medication therapy by enzymes (19). Cellulase is the only medical treatment of the symptoms, but bowel obstruction followed by this treatment is a complication effect due to bezoar dissolution passing through the stomach and trapping in the intestines (20). Endoscopic procedures are used for crushing and suction of mass. For larger diospyrobezoars, gastrotomy or laparoscopic procedures are suggested (7, 19). Tools such as CT scans, endoscopic evaluation, and abdominal ultrasonography could help to determine diagnosis. An endoscopic procedure is suggested as a useful method. Gastrotomy or laparoscopical procedures are also suggested for treatment of a larger diospyrobezoars. The diagnosis of appendicitis is often a clinical challenge since appendicitis can mimic several abdominal conditions. To our knowledge, this is the first report of an appendicitis-like syndrome in a patient with a bezoar in the stomach. As a result, diospyrobezoars are uncommon, and they remain a challenge in diagnosis. In atypical cases of acute abdomen pain, bezoar formation should be considered as a possible etiology; taking into account patients’ detailed dietary history, particularly their recent diet, is of great importance in diagnosis. It should be noted that the best prevention for this condition is to have good eating habits. The authors would like to recognize all staff members for their cooperation. Authors’ Contribution: Minoo Saatian, study concept and design; acquisition of data; analysis and interpretation of data, drafting of the manuscript; and administrative, technical, and material support; Minoo Shafii, study concept and design; acquisition of data; analysis and interpretation of data; drafting of the manuscript; and administrative, technical, and material support; Seyedeh Sara Bayesh, study concept and design; acquisition of data; analysis and interpretation of data; drafting of the manuscript; critical revision of the manuscript for important intellectual content; statistical analysis; administrative, technical, and material support; and study supervision; Reza Najibpour, study concept and design; acquisition of data; analysis and interpretation of data; drafting of the manuscript; and administrative, technical, and material support; Yasaman Omaraee, study concept and design; drafting of the manuscript; and administrative, technical, and material support.